Haitian children ravaged by the recent earthquake will soon be wearing the brand new, brightly colored soccer uniforms donated to Children’s Hope by a Chicago area youth soccer league. With around 300 uniforms already delivered to street children ministries in Ethiopia there were over 200 left over to bring joy to kids in Haiti as well. A Haiti relief campaign, sponsored by several area car dealerships, called “St. 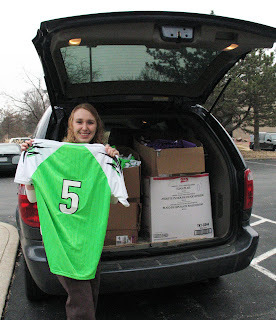 Louis Kids Kick In and Go To Bat For Haiti”, is more than happy to deliver the uniforms to Haiti.